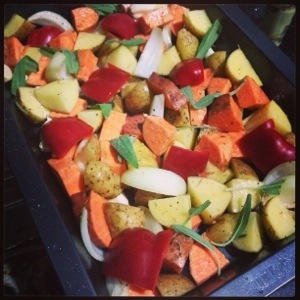 The Occasional Vegan : Roasted Vegetables | Eating Aloud! I’ve always loved various root vegetables. This one is a mixture of potatoes and sweet potatoes. I roasted them together with onions, whole garlic cloves (with skins) and red peppers. Seasoned with salt and pepper, olive oil, a pinch of chilli powder and a scattering of sage leaves. A simple and easy, throw-everything-in-the-pan-and-roast dish.